The story behind the name: Centaurus is one of two constellations said to represent Centaurs, mythical creatures with a human head and torso on top of a horse's body. Centaurus was the name of the first Centaur. 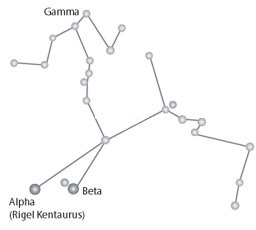 The constellation is primarily associated with Chiron (Cheiron), a wise, immortal being who was King of the Centaurs. He was said to be skilled in the healing arts, and to be a scholar and a prophet. From his cave on Mount Pelion, he is said to have raised, tutored, or counselled several persons prominent in Greek mythology, including Jason, Heracles and Asclepius. There are several stories which explain Chiron's association with this constellation. 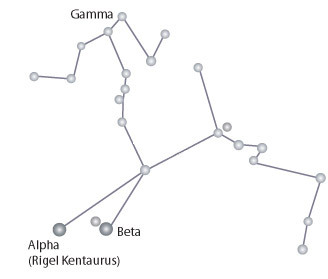 One legend says that Chiron was the first to identify the constellations and teach them to humans. He placed an image of himself in the sky to help guide Jason on his quest for the Golden Fleece. A different story says that Chiron was placed in the sky by Zeus. There are several variants of the story, but the incident common to most is that Chiron was accidentally wounded by a poisoned arrow and was in such continuous pain that he offered to give up his immortality. In one version, Heracles was attacked by a group of Centaurs who were enraged that he drank from their communal wine jar. An arrow fired at the attackers hit Chiron instead. In another, Chiron, Achilles and another Centaur, the prophet Pholus, were entertaining Heracles and an arrow (somehow) pierced Chiron's foot. Another version says that Chiron was not so much in pain but just tired of his long life. At this point Chiron's story connects with the legend of Prometheus, the Titan who underwent perpetual torture for stealing fire from the gods to give to humans. Prometheus could not be released from his torture until an immortal being volunteered to give up immortality and go to Tartarus in his place. Someone - there are variants suggesting Zeus, Heracles, or Chiron himself - suggested that Chiron's offer be used to release Prometheus. Zeus honored Chiron with a place in the sky. Another story suggests that the constellation represents the Centaur Pholus who was honored by Zeus for his skill in prophecy. The constellation has a large, four-sided shape representing the human head and torso, attached to two legs. Rigel Kentaurus, the triple star system that contains Proxima Centauri, the closest star to our Sun, forms one of the Centaur's feet.